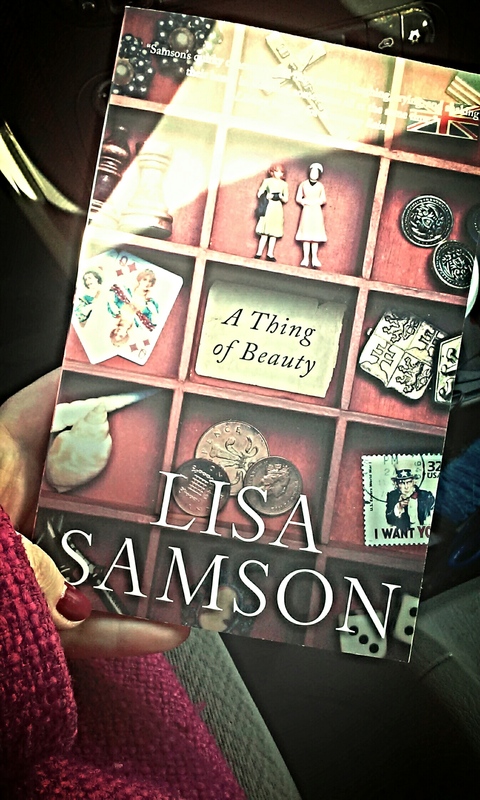 I’ve written about Lisa Samson in posts past. Like here where I write about how one of her books helped me mourn the death of a good friend. Or here where I use her as a name-drop about 30 times in a ranty post. Anyway, I love Lisa Samson. She’s the reason I didn’t give up on writing. No kidding. Well, last week I picked up a copy of her newest (and last) novel A Thing of Beauty. It officially releases this week. Somehow I got a copy at my favorite place, Baker Book House. I may or may not have gasped, held the book to my chest, and wept like a baby. Okay. Not the weeping part. Did I say that I love Lisa Samson? Because I do. Jittery, I waited to begin reading until I had time to really dig in. I wasn’t disappointed. Here’s the thing about this book: it’s very different from what one might expect from the “Christian” publishing world. The characters in A Thing of Beauty are very human. A few of them are broken and in possession of quite a bit of baggage (literally and figuratively). There is no salvation message. No explicit mention of Christ or Christianity. People, there are CUSS WORDS in this book. But you know what was there? Redemption. Community. People living selflessly to prop up somebody else. Love (all 4 kinds…if you’re a C.S. Lewis nut like me, you’ll know what they are). There’s a story of healing and forgiveness and reconciliation. This book really is beautiful. However, if you read “Christian” fiction as a means of isolating from the world…this isn’t your book. If you’re offended by hard words…move along, little doggy. If you want something fluffy (which is totally fine! )…pick another novel. If, though, you want to be moved by a book, made to feel a bit uncomfortable, if you would like to be challenged … you’ll want to get your hands on a copy. Lisa is moving on to exciting things in life and leaving the writing world. But she’s given her readers a nice little “see ya” gift. A small token. A story of hope. A Thing of Beauty. But…..I think you are an exceptional writer as well. Loved Paint Chips, but My Mother’s Chamomile had me crying for sure. Thanks! Oh, and thank you for the kind words. You have no idea how much they mean to me. Love this review compared to a certain other one. You are honest but balanced and represent the actually content well 🙂 I’m grateful for authors like Lisa Samson who don’t pull punches or sacrifice the integrity of authenticity! Thanks for hopping over, Laurie! You know, I think the certain other review was based more on what the reviewer expected. If the reader hadn’t known anything of Lisa’s writing, including the Christian fiction label, she would have really enjoyed the book. I read widely and try to read a good balance of ABA and CBA. Maybe that makes me long for more books that can flex for both markets like A Thing of Beauty does. Perhaps this is a new phase of Inspirational fiction? Nice of you to comment, Laurie. Thank you. Sounds like a book I will actually enjoy! I’m so not a fluffy, “happy ever after” kind of person or reader. I like a writer with the guts and gumption to be real – and do real – in their books. And yet, still showing that good and hope is around. Which is actually one of the reasons why I enjoy yours, Susie. You have the guts and gumption to do real – and still have faith, hope and good shine. Beth, you’ll love Lisa’s books!